In South Africa we have a blogging platform called Letter Dash. Letter Dash is host to a whole collection of blogging arena’s including the media24 stable. When I started blogging the only food related blogging platform on Letter Dash was food24. I stayed th loyally even when Taste started their own blogging platform, as I believe in loyalty. In fact, whenever I saw a blogger on the global South African platform, blogging about food I suggested they come over to food24. Then a series of happenings started with a certain blogger being most rude about other bloggers on this platform. This resulted in a 101 series of blogs where there was not enough space for my post on ethics and copyright. That aside, I was not getting any ‘front page’ exposure on food24 as this was left to the ‘in crowd’. I was however briefly a blog of note and got a ‘heard on food24’ mention every day. Not to sound like sour grapes, but I just felt this was not enough for me. I have been blogging on Letter Dash for over 2 years, and I have published more than 860 posts and I felt the need for some more exposure. I decided to move over to the Taste platform to see if I would get more exposure and within two weeks I was featured on the front page of their newsletter (read my post here to celebrate). But, the biggest exposure has come my way as I am the featured blogger in the Taste Magazine November issue! This issue is a readers collaboration, and goes on sale today at all Woolworths Stores nationwide. Woolworths in South Africa is the equivalent to Marks & Spencer in the UK, and Taste Magazine is their in house magazine, run under the New Media Publishing stable. 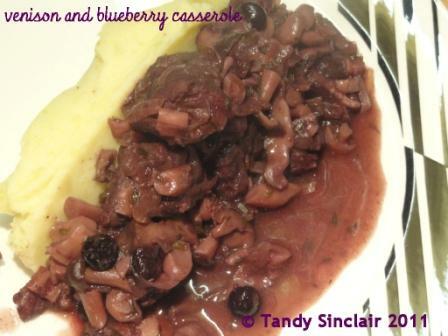 To celebrate this great accolade I have made another dish using Woolworths ingredients, namely venison and blueberries. Congratulations, Tandy!! You deserve this! How exciting – huge congratulations on the feature and also on the great recipe! Must find friend who has too much venison! This looks great. P.S. recipe looks amazing also. Congratulations on the feature in Taste Magazine! I think I bought that magazine while in South Africa. Hearty congratulations, my friend, I am so proud of you! Congratulations again Tandy – looking forward to seeing you in print! thanks Mandy, and a happy day to you too!